J. Gordon Zink, American osteopath and longstanding docent in the department of osteopathy at Des Moines University, Iowa, devoted much of his life to studying the fasciae as well as the effects of fascial imbalances on posture and circulation. Thanks to Michael Kuchera (continuing education course, May 2004 in Berlin), who had the good fortune of working with Zink, the latter became known towards the end of his career as an osteopath with short treatments and fast results. He had developed a diagnostic method by which he was able to diagnose a dysfunctional region with just a few grips, as well as to determine just as quickly how effective his treatments had been. Zink's research focused on posture, fascial tensions, and on their effects particularly on lymphatic circulation. Hence, he was able to determine that certain postural patterns were based on particular fascial tension patterns. He took advantage of this fact in both diagnosis and therapy. For the purposes of his research, he examined com-plaint-free people as well as people with complaints and arrived at interesting conclusions: even in people who considered themselves completely healthy and indicated no complaints at all, Zink found a fascial torsion pattern. People without a fascial torsion pattern are extremely rare. In all other "asymmetrical" people, Zink found a particular torsion pattern. He realized that the fascial pattern reverses at the functional junctions in the spine(occipitoatlantoaxial|OAA],cervicothoracic[CTJ], thoracolumbar |TLJ], and lumbosacral |LSJ]). In this context, fascial pattern refers to the ease with which a region permits rotation (ease bind). At the same time, it is an indication for fascial bias in the direction of the free movement. Because this was the most common fascial pattern in healthy people, Zink called it the "common compensatory pattern" (CCP). This pattern he called "uncommon compensatory pattern" (UCCP). When the fascial biases change at each of the anatomical transitions, this means that the person has found a homeostatic postural adaptation. The organism has been able to compensate successfully, even if it was unable to adopt the "ideal" adaptive pattern without torsions. • The reversal of fascial bias takes place in regions where we find diaphragms (anatomical or functional ones). As we know, these play an eminent role in venolymphatic circulation as active pumps. • The areas of reversal are also those areas in which a lordosis converts to a kyphosis or vice versa. These are also areas of reversal in scoliotic curvatures. Note: When we further pursue this notion of diaphragms and transitions, we cannot avoid discussing the sphenobasilar synchondrosis (SBS) and the cerebellar tentorium. We are all aware of the significance of the tentorium for the circulation of the head. 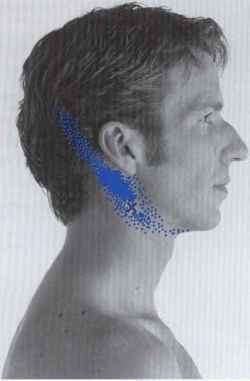 From cranial osteopathy, we also know how important the SBS is for postural adjustments. If this has not become obvious from what we have written above, we hope that the following sections will make this evident. The upper thoracic aperture or the cervicothoracic diaphragm is a functional diaphragm. The so-called anatomical thoracic inlet is formed by the articulation of the sternum, the first pair of ribs, and the first thoracic vertebra. The functional thoracic inlet is identical to the clinical thoracic inlet and is formed by the manubrium, the angle of Louis, the first pair of ribs laterally, and the first four thoracic vertebrae. In this thoracic aperture, we find the two pulmonal apexes, as well as vessels, nerves, trachea, and esophagus, which constitute the upper mediastinum. These structures are enveloped by Sibson's fascia, which originates from the fascia of the two longus colli muscles (reaching down toT4-T5) and the visceral leaf of the scalene cover. It covers the apexes of the lung and attaches to the vessel trunks of the thoracic inlet, to grow together with the pleural dome. This Sibson's fascia is the real cervicothoracic diaphragm.